It would be difficult to find anyone living in 2015 who doesn’t know what Google is, and an even tougher task to find a person eligible enough to be accepted by this enormous Californian family. The volume of CVs sent to Google is unbelievable when you look at numbers. The number of people who are invited for interview is even less! That is quite understandable: you’d be really lucky to find more than a few people who wouldn’t want to work for Google. And it’s no revelation that Google is featured in Fortune’s “Top employers” list every year. Just so you know, Apple and Facebook are not even included on this list. 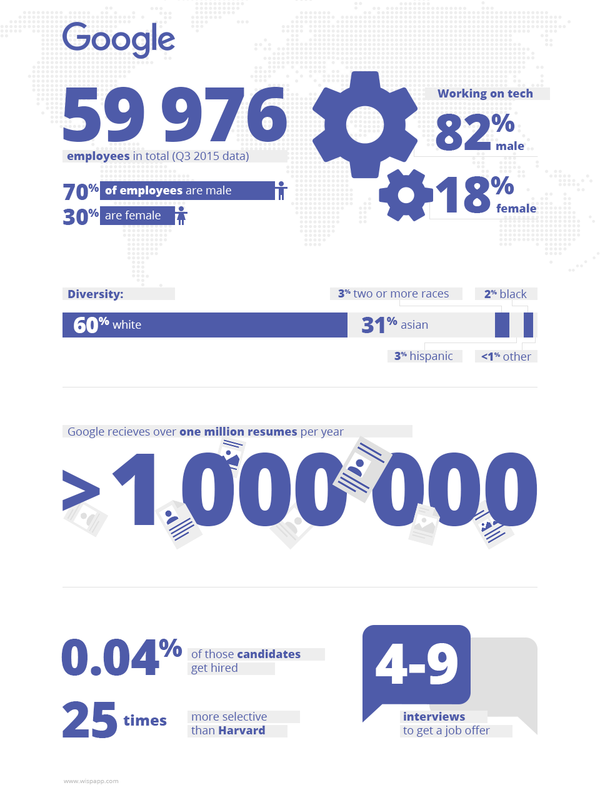 Check out our small infographic, which is based on data from open sources, so you know the deal with Google employment. So, what attracts people to apply for a job with this Internet giant? There is no clear hierarchy. Every employee has the right of veto, and Google makes sure that everyone is heard, not ignored or squashed under some authoritarian rule of managers. Google perfectly understands that pressurizing employees and forcing them to do something against their will won’t get them anywhere. Technical equipment. All Google employees receive a laptop model of their choice. Fancy desktops? Please, get one – oh, and with a 21-inch dual screen, of course. Google’s tech support team is kind of a legend – they provide 24/7 help so not a single Google employee faces any hardware or software problems. Unlimited food supply for any taste or preference. Google feeds its employees as well as possible – you can’t innovate on an empty stomach. The famous 80/20 rule. For 80% of office time, the average Googler is working on assignments, while the remaining 20% is dedicated to personal projects. No matter, what these are, an employee just needs to make sure that it’s for the good of the company. 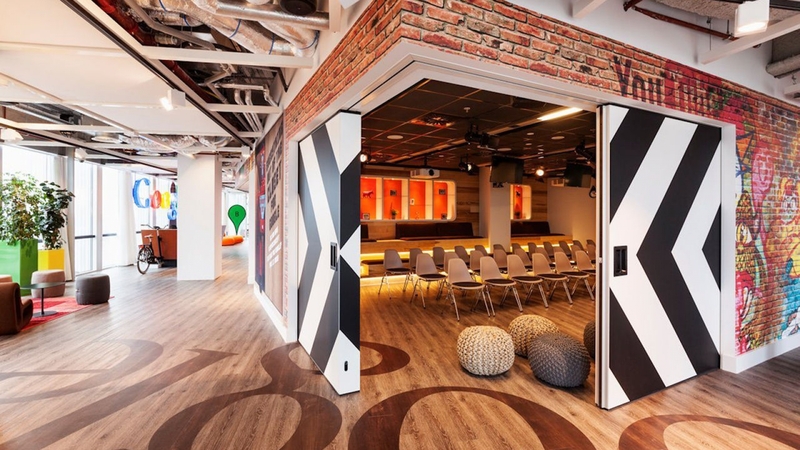 Whatever you need, Google has it on-campus: barber shops, restaurants, daycare centers, kindergartens, massage rooms, petrol stations, car washes… and those are just the ones we can remember. Language courses for everyone, free of charge, of course. A parents’ paradise. At Google, they have smart maternity- and paternity-leave policies, salary extras for newborn children and corporate kindergartens. If a Googler passes away, his or her family will receive half of the employee’s salary for next 10 years. Google cares for their employees, even in the afterlife. Got ill? No problem. The Google team will try to focus on your recovery, so you can get back to work as soon as possible and continue right where you left off. And there is a medical team on-campus, of course. Don’t leave Fido home alone. Bring your furry friend with you. Google thinks pets boost employees’ productivity and create a friendly environment in the workplace. Googlers are lucky to live in the future. Google tests all products internally, and some aren’t even released to the public. 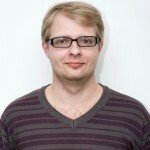 Betas for Android, Google Glass and Chromecast; early builds of Google Chrome – you name it. Oh, and Googlers also get a nice paycheck! What exactly does Googleyness mean? Google is looking for three particular attributes in their candidates, and those metrics are decisive when it comes to recruiting the right person. First and most fundamentally, Google is looking for curious, productive people who want to give this world something new and outstanding. Lazy, boring people won’t ever be accepted as employees for the Californian colossus. Secondly, it’s all about ambition. If you’re looking for a job just to earn money, Google isn’t the place for you. The third factor is that Googleyness we mentioned above. Google consciously tries not to look for people who “look like us”: preference is given to offbeat, unique talent which can challenge world order and offer something truly unique. They have been questioning the status quo for a long time, and they want their talent to join the crusade for innovation. If the candidate is a conservative coward who lives by a traditional code, he will probably be rejected. We can thank one person for this “googleyish” uniqueness of culture and treatment of employees – chief cultural officer, Stacy Sullivan, who is charged with making sure “Google’s culture stays true to itself.” She is also in charge of the so-called culture clubs that are responsible for building this unique environment. And that applies not only to the Californian HQ – all 70 local offices are under her jurisdiction. 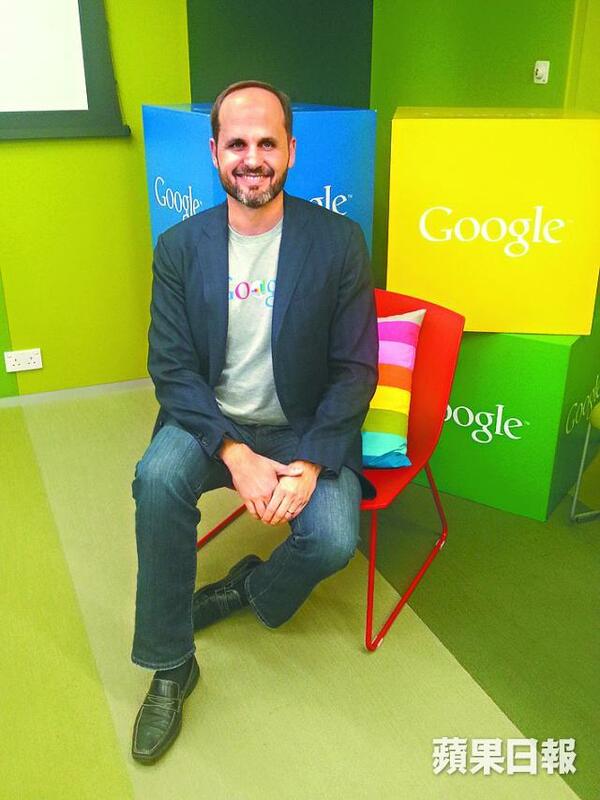 Laszlo Bock, head of the Google human resource department (which is called Google People Operations, by the way), is responsible for HR policy itself. The key point about POPS (People Operations department’s short internal name for Google employees) is that “we find them, we raise them, we keep them,” hence the title of the “talent cradle” of Google. Instead of focusing on training and courses to educate employees, Google prefers to bet on their self-education. POPS’ point is that “courses are just a tiny bit of what we can offer.” Also, don’t forget that Google likes employees who are not frozen in time and keep growing all the time. Removing the abstract bureaucracy hunt for its employees, the approval time for ideas was reduced from months to days. Google tries to keep this environment of creativity and remove all obstacles to innovation for Googlers. The company tries to invest whatever it takes to allow Googlers to focus on nothing else but growing and giving the very best results. They literally try to invest anything they have in their employees. And those investments have been justified. Google has a reputation as one of the most desired employers; its employees are the happiest, and its HR practices are the most valuable.